← Taco Tuesday meets Cinco de Mayo meets Meatless May. I’m quite thrilled about my first ever guest blogger. One of my favorite things about my husband is his first cousin, Hanna. I absolutely adore her, and have from the moment we met. We truly bonded when we were both pregnant with our now eleven year old boys, and I had horrible insomnia. I’d call her in London while it was the middle of the night in LA, and we’ve been talking ever since — sometimes daily. Firstly, I would like to say how totally honoured I am to be guest blogging here today. Despite being divided by an ocean (and for many years a continent to boot), Lea and I share a mutual love of books, art, shoes, dark chocolate, the colour lime green and the beach. However, while she loves to run (I only ever run out of necessity), I love to cook (she claims only to cook out of an obligation to fuel her team). Three of our children are the same age. In my early years of motherhood, this was somewhat anxiety producing for me. Those Geller children would chow down on lentils (all pulses to be precise), quinoa, seaweed, tofu and devour every colour of the vegetable rainbow. Daily. Mine, on the other hand, had a very consistent white diet – fish and chips, grilled cheese, macaroni. Not even a stick of cucumber or a lick of pesto would pass their lips. During our almost daily catch up, we would discuss at length any recent shenanigans and of course, the menu. So here I was, in a cloud of shame and envy, a failed mother, giving recipe advice. I just did not understand. There was nothing I loved more than to cook. And my children rejected it all. And here was Lea, who claimed that meal prepping was the bane of her existence, and hers ATE ANYTHING SHE PUT ON THE TABLE. 1. She always makes 57 items for the table (I make 3). 2. There is always a backup option. 4. Only someone with a larder (pantry) as well stocked as hers actually loves putting meals together. And it means that whenever I give her a recipe she always has every ingredient on hand. 5. She goes to the supermarket at least 5 times a week. Out of deference to this apparent (but not quite true) dislike of cooking, I want to share what I consider to be my most basic recipe, and assist the Meatless May campaign. Miso Salmon is loved by all (even my own boys who have finally increased their repertoire). It has only two ingredients (I used to make it with a lot more), takes seconds to throw together and minutes to make. Et voila! Dinner. 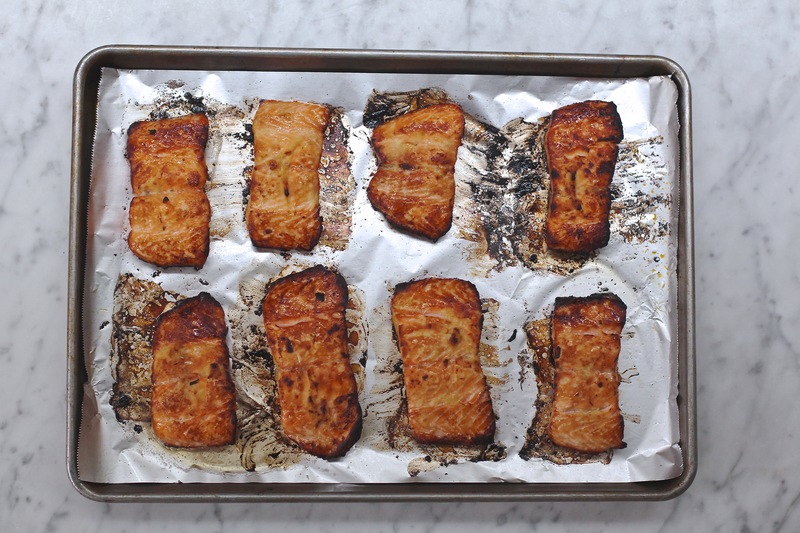 I used to make the miso grilled salmon recipe from John Ash’s book, Cooking One on One, a staple in my collection and given to me by Lea many years ago. But after my last baby, I was short on both ingredients and time and made this. And it stuck. It is so simple it is almost embarrassing to share. But here goes. It’s a winner. Note: I used 8 salmon fillets as the Geller family is larger than most. But the general formula, is 1tsp white miso per fillet so it is a cinch to scale up or down. Take the salmon out of the fridge 30 minutes before cooking to allow it to warm up to room temperature. Turn each piece over and grill another 3 minutes until just translucent in the middle. where is the picture of yours??????? ?